Let's face it at the outset. It is not easy. With the hundreds of guides starting with "How To", at least a dozen must be on how to get your wife's love back. Some of them speak about the ways that you can surprise her, while others focus on the merits of appreciations. However, all of them would account to nothing if done without sincerity. If you try to fool your wife by lying about how wonderful she is when you feel quite the opposite, she will catch your bluff in a matter of eye-blinks. That would do more harm than ever to the chances of rekindling her love for you. The following suggestions focus on you understanding her value, so that you rekindle your love for your wife before attempting to rekindle her love for you. One of the most prominent reasons for the loss of love between couples is that they start taking each other for granted after a few years. When you come back from the office, you are absolutely sure that your wife will have completed all her tasks. Then begins the phase when your appreciations stop, and your wife begins to feel that she is performing a thankless role. Remember the initial times together, when you would not tire thanking the heavens for just a smile on her lips. She would do nothing more than throwing a careless smile at you and you would have thanked her a thousand times, if provided the opportunity! Look at all the tireless efforts which she puts in now to make your life comfortable and realize how thankless you have been. Once, you realize this, go to her and thank her for all that she has done for you over all the years. Be earnest in your praises, and don't say anything which you don't mean. You might think that you are a good actor, but your wife is a better detective! When it comes to women, gifts have always done the trick, and for ages now. Surprise her with gifts on days she is least expecting them. Contrary to what the ads for diamonds will have you believe, women are not half excited by the price of the gift than the manner in which it is given. Given properly, and with the right dose of romance, a single rose can achieve what entire sets of pearls cannot. Vacations, dinner-outs, movies, etc. are other brilliant ways of rekindling your wife's love. Most marriage counselors opine that marriages break when the couple stops spending enough time with each other. No matter how busy your schedule is, find out time and spend time with her. Replace the window-drapes, re-design the drawing room, or just let her lie in your arms. Just being with her will assure her in multiple ways. 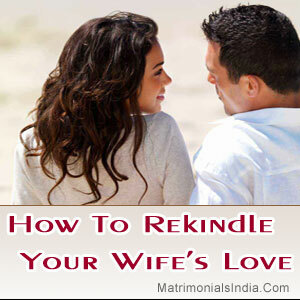 The attempts to rekindle your wife's love should not be a temporary fix of the problems. They should be long lasting solutions which pave the way for the romance being kept alive all throughout.